Jack is a member of the Class 1964 and a four year member of the Wrestling Team. After completion of Submarine and Nuclear Power training he served two sea tours on USS Seadragon (SSN 584) and USS Barb (SSN 596). In between the sea tours he was an Instructor in the Officer Department at Nuclear Power School on Mare Island. Jack left the Navy in 1972 due to complications from his USNA wrestling injuries. He then earned his Certified Financial Planner certification and owned and operated The Financial and Tax Planning Center in Sacramento and Roseville until his retirement in 2008. 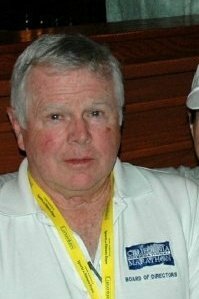 He has been a wrestling referee for almost 50 years and claims to be the last of his classmates to be active in Navy Athletics as he officiated the Navy Classic Wrestling Tournament in the Halsey Field House from 2003-2008. He and his wife Patricia live in Lincoln, CA. Bob was told by his mother while growing up, “Bob, you were born to be retired and a grandpa.” Bob fulfilled his destiny in 2010 when he left the workforce and his first grandchild was born. Initially assigned to the USS Schofield (DEG-3), he earned his SWO pin before requesting assignment to flight school in 1976. Upon gaining his pilot wings, he entered the ASW/patrol community and served in two Moffett NAS based squadrons. His only shore duty in the Navy (other than being a student) before he retired in 1995 was always with Navy Recruiting Command in California, Washington D.C. and upstate New York. After the Navy, Bob managed retail furniture stores and then was head of a private junior college. He then recruited prior service members to become teachers in high-need areas through the federal “Troops to Teachers” program. After retiring from the Navy, Bob used his GI Bill to get a Masters of Arts in film. Since 2010 he has been a full-time author. 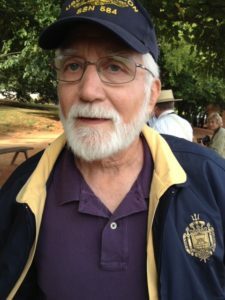 Currently he has thirteen titles in print, mostly fiction about sailors. Colonel McKay was born in Denver, Colorado and reared in Latin America. He enlisted in the U.S. Marine Corps at age seventeen. He deployed with forward elements of the First Marine Division, slated to land in Cuba during the 1962 Cuban Missile Crisis. He received an appointment from the ranks in 1964 to the U.S. Naval Academy and after graduating in 1968, was commissioned into the U.S. Marine Corps. He twice deployed to the Republic of Vietnam as an infantry officer, where he was wounded two times. 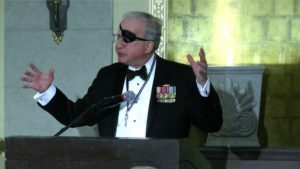 Notwithstanding the loss of an eye, Colonel McKay remained in the Marine Corps as an infantry officer, commanding infantry units at every rank. He is an Olmsted Scholar, having studied at the University of Madrid, Spain, for two years. He holds advanced degrees from Georgetown University, and the National War College. In and out of Uniform, Colonel McKay has served in three diplomatic postings. He was the United States first accredited Naval Attache to the Republic of El Salvador during the country’s bitterly contested civil war. He has conducted formal negotiations with representatives of the Communist Government of Cuba, and the Palestinian Authority. Colonel McKay has conducted overseas counter-drug operations for the CIA and DEA. He is currently an Adjunct Professor at California State University, Sacramento. Colonel McKay is fluent in Spanish and has a working knowledge of French. He is a published author. He is married to Margo C. McKay, nee Pace. Colonel and Mrs. McKay’s three sons are USMC and US Navy Veterans. Colonel and Mrs. McKay reside in Fair Oaks, California.